36 • SPONSORED CONTENT • JUNE 2018 Welbilt and Wawa: A Match Made in Hoagie Heaven THE NEED FOR SPEED Wawa, a Media, Pa.-based convenience store chain with locations in Pennsylvania; New Jersey, Delaware, Virginia; Florida; Maryland; and Washington, D.C., special- izes in foodservice items, including its popular toasted hoagie sandwiches. Its stores are particularly busy dur- ing lunch hours with customers seeking toasted sandwiches. Wawa began using Welbilt's Merrychef eikon ® e4 high speed oven 12 years ago. Ideal for fast, energy-efficient preparation of crispy baguettes, croissants, snacks and toasted sandwiches, its three different cooking levels and compact design fit the chain's needs to a tee. "We are busy at lunch time with customers who request toasted sand- wiches, and with this oven, we are able to meet our customers' demands," ac- cording to Laura Anderson, the chain's senior manager of strategic sourcing. "We're constantly trying to fit new equipment in, but we don't always have the space," says Anderson. "We were getting close to outperforming in terms of capacity and, subsequently, needed to find a solution." Wawa brought in executives from Welbilt's Merrychef team to brainstorm about the space issues relative to its equipment. With toasted hoagie popu- larity continuing to grow, the concern was that the stores would outgrow the oven. Wawa worked with Merrychef to de- velop a high-speed oven with a smaller footprint to keep up with increasing de- mand and help improve speed of service. "We gave the folks at Merrychef our criteria," says Anderson. "The chal- lenge was to develop the design to create a prototype within a year; they accomplished this by producing a pro- totype in just around six months. The collaboration was amazing." 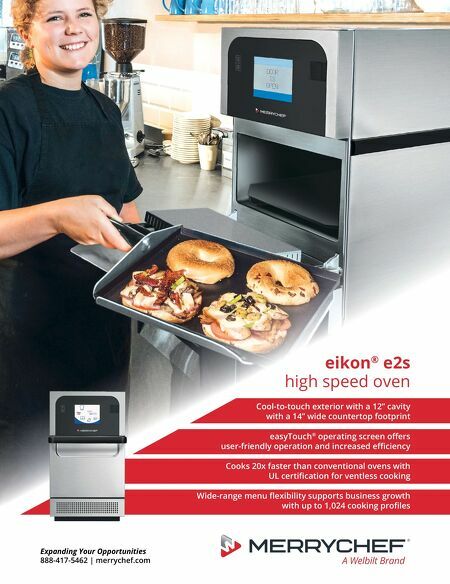 The company created eikon ® e2s, a smaller footprint oven that works exactly the same as its traditional eikon ® e4 Merrychef model. The big difference is with the newer version, two ovens can fit in the space of one of the former models. With the eikon ® e2s, not only is speed of service increased, but the out- put has now doubled. This oven prepares fresh, hot food on demand where space is at a premium. It offers the smallest unit with the biggest results to add value to all kitchen operations. It is available as eikon ® e2s Classic in traditional Merrychef design or as eikon ® e2s Trend, with a color-coded exterior, soft edges and small ware storage on top. The two smaller ovens are able to be situated adjacent to Wawa's refriger- ated sandwich stations for added ef- ficiency, convenience and speed. "This newer version has helped us expand our hoagie program and minimize cus- tomers' wait times," says Anderson. As the company expands its sites by 50 stores annually and continues to remodel 75 stores a year, Wawa plans to add the space-saving eikon ® e2s ovens to these locations. "Merrychef's high speed ovens have definitely been a critical aspect of our growth plan, especially in the foodser- vice segment," says Anderson. "And working with Welbilt and Merrychef has been a very positive experience. They are great, innovative partners." Welbilt.com Half the size of the original with the same output, Welbilt's eikon e2s models are perfect for any sized kitchen. 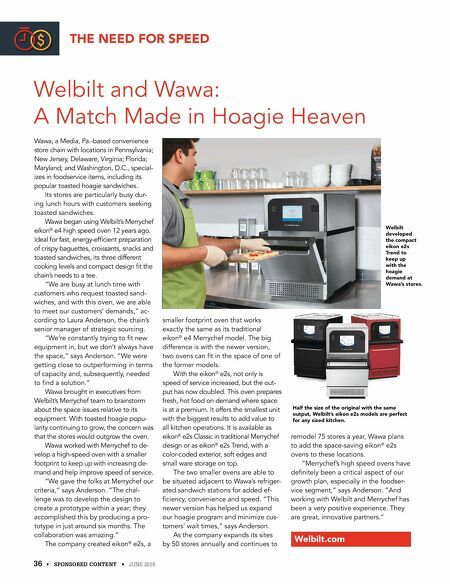 Welbilt developed the compact eikon e2s Trend to keep up with the hoagie demand at Wawa's stores.